Brandy Rivas grew up in South Florida, and horses were always high on her priority list. It’s where her heart lived. She rode every chance she got, on vacations and over summer breaks, but it wasn’t enough. By age 11, she knew she needed to learn more if she was going to progress in the field. She bugged her mother, who offered a solution. “Open the phone book, and pick a stable,” her mother advised, and that’s just what Brandy did. That didn’t last long. Brandy drifted back to horses, picking up catch rides at different barns, riding in exchange for work. When she found out that her grandmother had bought a horse for one of her cousins, she lobbied successfully and finally had another horse of her own. Time passed, and she realized that simply riding wasn’t going to be enough to sustain her. 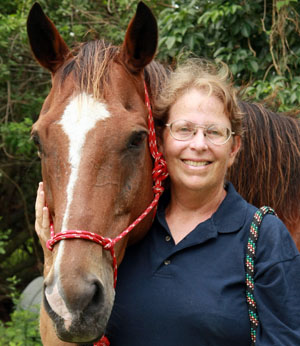 And so, 14 years ago, Brandy became the owner and head trainer of Equines and Equestrians Inc. at Sunshine Meadows in Delray Beach, a 40-stall barn which currently houses 20 horses. Brandy likes Sunshine Meadows because of its large size and amenities. The maintenance is taken care of, and there are so many places to ride: rings with all sorts of jumps, mirrored dressage arenas, room to roam on trails, and lots of round pens. The CBS barns are also hurricane approved. She’s a United States Hunter/Jumper Association certified instructor, and she constantly strives to update and improve her skills and knowledge, attending clinics and taking lessons with other clinicians. Brandy’s goal is to offer clients a family-oriented barn where they can achieve their goals, whatever those happen to be. One example of Brandy’s willingness to help others move up is Marcus Au, her working student. Marcus started out at age 10 working at another barn in Sunshine Meadows, cleaning stalls in exchange for riding. A year later, he found Brandy and started working for her. It is now five years later. Kim Randolph and her 9-year-old daughter Hannah keep Giddyin, their pony, at Brandy’s barn. Beth Giddings keeps her chestnut Appendix mare, Birdie, at Brandy’s barn. Beth likes how flexible Brandy is. In that way, Brandy is like another mother figure for the kids, Beth said. For more information about Brandy Rivas and Equines and Equestrians Inc., call (954) 650-4324 or visit www.facebook.com/eandehorses. Next articleSure, I Can Make Resolutions, But Can I Keep Them?